You’ve got questions? We’ve got answers… hopefully on this page. If not, use the livechat feature on our website or contact us. Are GrowJourney seeds certified organic? Yes, all GrowJourney seeds are USDA certified organic via The Department of Plant Industry at Clemson University. What's the difference between organic seeds and conventional garden seeds? Organic seeds will grow better in an organic garden/farm, are not permitted to have any genetic contamination and are produced in a way that is safer for people and the environment. Click here if you’d like to read more about this important issue. None of our seeds are genetically modified. At this point, genetically modified seeds are only sold and used in the commercial agricultural sector, not the home gardening sector. Even if they were available to gardeners, GrowJourney would only offer certified organic, open-pollinated, heirloom garden seeds. Sustainably feeding everyone on earth with real, healthy food is entirely possible, but it’s going to require a new, more thoughtful paradigm than we’ve ever used before. If you’re interested, we’ve outlined our stance on genetic engineering a bit more over on Our Seeds page. Can I save seeds from year to year? Seed saving is SO incredibly important to a healthy, biodiverse food supply. Plus, the next generation of seeds will be even better adapted to your specific growing environment via natural epigenetic processes. Yes, your seeds will quite literally “customize” themselves to your garden/growing environment. You can read more about that process over on Our Seeds page. What if I don't like a seed variety I get? Simple: just let us know, and we’ll replace it free of charge. The GrowJourney Guarantee is that: 1) you’ll love the seeds our team selects for you, and 2) they’ll grow where you live (see more about that in the next question and answer). Are my GrowJourney seeds guaranteed to grow? We guarantee they’ll grow in your climate zone at some point during the year. We do try to send your seeds seasonally, meaning they’ll arrive before or during the time window when you’d want to plant them. For instance, we send summer seeds in winter and spring; we send cool/cold weather seeds during (summer and fall); etc. It’s impossible to guarantee that 100% of the seeds in each seed packet will germinate and grow into mature plants. That’s not how nature works, and there is germination rate variability between different seed varieties. However, all GrowJourney seeds have been independently tested to have the highest possible germination rates for the variety offered (you can find the germination rates on the front of each GrowJourney seed packet). c) store your seeds indoors (moisture and drastic temperature fluctuations can damage seeds). It’s also important to note that seeds do lose viability over time, which is why our seed packets and GrowGuides tell you how many years your seeds will remain viable (it’s usually between 3-5 years). How long will the seeds last and should I plant them all at once? GrowJourney seeds will last for years. Inside each paper packet, you’ll notice that we’ve packaged your seeds in an extra plastic seed baggie–this ensures they’ll last even longer by reducing moisture exposure. How long will GrowJourney seeds last? Each variety is a little different, which is why we put the expiration date on the front of all of your seed packets. That makes it easy for you to save your seeds for future years, if you’d like. So if you don’t have much space or time right now, consider planting a few seeds this year, and hanging on to the rest for later down the road. Every serious gardener we know ends up having their own personal “seed library.” Also, consider sharing and swapping seeds with other gardeners in your area. Why do you include edible flowers and herbs in some of your monthly seeds packages? Polyculture plant systems (e.g. growing multiple varieties of plants together in symbiotic systems) are one of the most important things you can do to create a healthy, biodiverse garden. Flowers attract crucial pollinators and beneficial insects that play a critical role in any garden system, from pollinating your fruits & veggies to controlling pest insect populations. Almost all the flower varieties we provide also have the added benefit of being edible to people too, making wonderful teas or additions to salad. Herbs also have multiple functions in a healthy, organic garden. They’re often effective pest-repellents, elegant landscape plants, and are key ingredients in lots of delicious foods. Growing flowers and herbs alongside your fruits and veggies is one of the keys to organic food production, wherein your plants operate like a symbiotic “team,” doing much of the work for you! That’s why we include heirloom flower and herb seeds in some (not all) of our monthly packages AND we show you where/how to plant them all together to get amazing results in the “Plant Guilds” section of our GrowGuides and QuickGuides. How many seed packets and varieties of seed come in each monthly package? It depends on your subscription. Our Small Garden Subscriptions offer 3 seed varieties each month, with each one ideally suited for growing in small spaces. Will I get the same variety of seeds more than once in a 12-month period? We sure hope not. We’re confident that we have systems in place to make certain you’ll never get the same seeds twice in any 12-month period. If you do, please let us know and we’ll send you some new, different seeds (on us) along with an apology letter. We’d also encourage you to save seeds from your own plants for the future, so you’ll never need to buy any of the same varieties we send you ever again. When will I get my first seeds? We try to send out your first monthly seed package within 7-10 business days after you first join. You’ll receive an email from GrowJourney with a USPS tracking code every time your monthly package ships, including the first one. That makes it easy for you to see where your package is and whether or not it’s been delivered. If it’s been more than two weeks since you’ve joined GrowJourney and you still haven’t received your first monthly seed package, check your tracking code from the shipping email, and contact us if something has gone wrong during shipping. Monthly Subscribers – If you join GrowJourney on a monthly membership basis, you’ll be billed for your first month’s seeds as soon as you join GrowJourney. From thereon, you’ll be billed on the same day of each month that you originally signed up, and your seeds will ship on or shortly after that date. Six-Month and Annual Subscribers – If you join GrowJourney on a 6-month or annual membership basis, you will be billed for your full membership when you sign up or at the end of your free trial month. Free Trial Members – If you are a free trial member, you will be billed $3.99 for shipping and handling for your free month, then be billed one month after your free trial period. Depending on when your free trial expires, this might mean you don’t receive your second month of seeds until later in the second month. Bob gets a standard monthly membership to GrowJourney on January 17th. His credit card is billed immediately and his first monthly seed package (for January) is shipped out within 7-10 days. On February 17th, John’s credit card is billed again and his February seed package is shipped within 3-5 business days. Margaret gets a standard 6 month membership to GrowJourney on Feb 27th. Her credit card is billed immediately and her first monthly seed package (for March since she joined after the Feb cut-off date) is sent on the 5th of March. Her credit card is not charged again until March 27th (her second seed package would ship around April 5th). On June 16th, Janet signs up for a free one month trial under a 6 month membership plan. Her card is immediately billed $3.99 to cover our shipping and handling costs. On July 16th, her card is billed for her full 6 month membership and her July seeds are shipped immediately. I lost my username and/or password. What do I do? Go to this link: https://www.growjourney.com/my-account/lost-password/. Enter the email you signed up to GrowJourney with. (If you don’t remember, just search your email for “GrowJourney” and enter whatever email we use to contact you. An automated email will instantly be sent to your email address so you can determine your username or set up a new password of your choice. What's the difference between a Small Garden and Large Garden subscription? Should I get a monthly, six-month or annual subscription? This answer depends on you and your needs. No matter what membership option you choose, you’ll get the same number of new, interesting, high-quality seeds selected for you and delivered to your doorstep each month + access to our helpful guides & instructions. The most important thing is to start growing and learning asap, regardless of which membership option you choose! How do your Gift Subscriptions work? We try to make our Gift Subscriptions as simple as possible for both the gift giver and the recipient. We have gift subscriptions to match any budget and any garden size. Our Small Garden Gift Subscriptions start at $29 and are ideally suited for gardens under 100 square feet (the recipient gets three seed varieties per month). Our Large Garden Subscriptions start at $44 and are best for gardens over 100 square feet. Both Large and Small subscriptions offer 3, 6, and 12 month options. Giving A Gift Subscription Via Email – During checkout, you can elect to either: a) have the gift membership email with sign-up instructions sent to your email, or b) have the gift membership email with sign-up instructions sent to the recipient’s email. If you elect to have the email sent to the recipient, you’ll also be able to write a personalized gift note. Either way, the gift recipient will need to use the instructions and membership activation code from the confirmation email to activate their new GrowJourney account and start receiving their monthly seeds. Giving a Gift Subscription Via a Gift Card? Some people prefer to keep the gift membership a secret and give their gift in the form of a gift card. Click here if you’d like to download and print a GrowJourney gift card. If you received a GrowJourney Gift Membership, please note that there’s no rush for you to register. However, we can’t activate your account or start sending your seeds until you have completed your online registration. Find the original gift email (search your email for the term “GrowJourney” or “orders@growjourney.com). In that email, you should see a gift code and the dollar amount of your gift membership – you’ll need this information to register. Next, go to our gift membership redemption page. Select the membership level that matches your gift’s dollar amount and add it to your shopping cart. Enter your gift code at checkout so you don’t get charged. Once you’ve completed your checkout, your GrowJourney account will automatically be activated. Depending on the time of month when you activate your account, your first seed package will ship in 2-10 days and you’ll have instant access to our online growing resources. Find the printed GrowJourney Gift Card you were given as a present. (*If your gift card has been lost, you can either ask the person who gave you the gift to find their GrowJourney order confirmation email which contains your account activation information, or you can contact us for help). The card should contain a Gift Code and the Gift Membership level you were given (Small or Large Garden Subscription || 3, 6 or 12 month membership). Select the membership level indicated in your gift card and add it to your shopping cart. Enter your gift code at checkout to reset your cart to $0. What's the difference between pausing and canceling my subscription? Pausing your subscription means you won’t be charged and won’t receive seeds, but you can still access our online educational resources AND reactivate your account whenever you’d like to start getting seeds again. Canceling your subscription is final. You will not be charged or receive seeds, and you will no longer have access to our online educational resources. Also, once you cancel, you can not reactivate your account. However, you can purchase a new subscription if you’d like to come back! How do I cancel my GrowJourney subscription? Oh, and please do us a favor: if you’re canceling your membership because you’re not satisfied with our service, please contact us to let us know what we can do better, so we can improve. Please note that, due to the way our order processing system operates, if you cancel within 7 days of your next shipment or renewal date, you will be charged for that month and receive a final monthly package. How do I pause or reactivate my subscription? How do I switch my subscription plan? 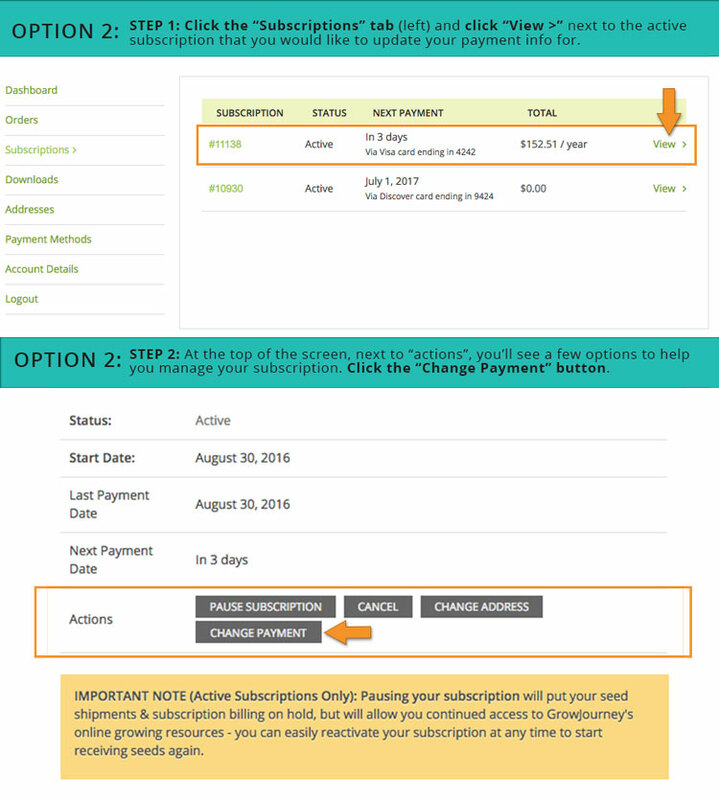 You can easily switch to a different type of subscription. For instance, if you have a Small Garden subscription (3 seed varieties each month) you can easily switch to a Large Garden subscription (5 seed varieties each month), and vice versa. You can also easily switch between our Small and Large Garden Monthly, 6-Month, or Annual plans. *please note: Your subscription must have a status of “active” in order to switch subscription plans. Step 1: Click the Subscriptions” tab (left) and click “View >” next to the active subscription. Step 2: Scroll down to the “Subscription Totals” section. 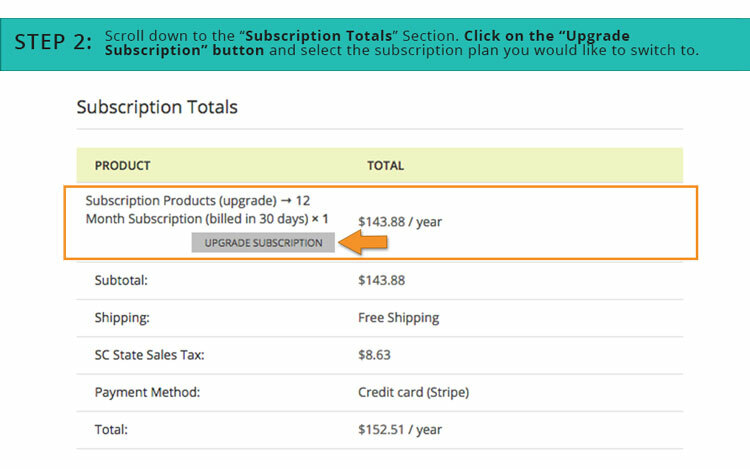 Click on the “Upgrade Subscription” button and select the subscription plan you would like to switch to. *please note:This will only affect future scheduled order payments, not payments due on a failed order. If you have a failed order and need to update your info, please follow the instructions for updating after your card has been declined. 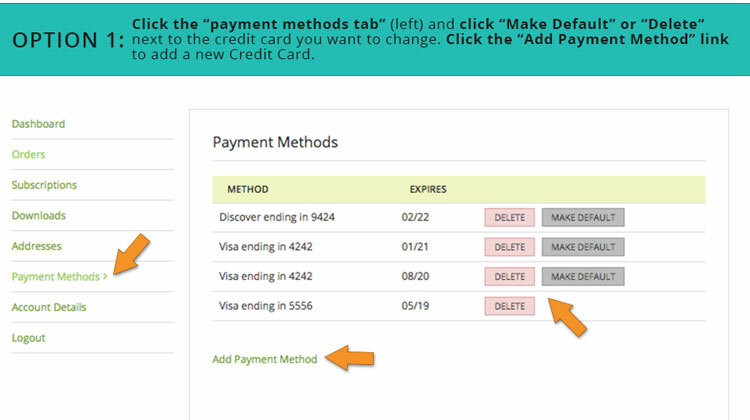 Option 1: Click the “payment methods tab” (left) and click “Make Default” or “Delete“ next to the credit card you want to change. Click the “Add Payment Method” link to add a new Credit Card. Changing the default credit card will change the card that your subscription is automatically billed to. 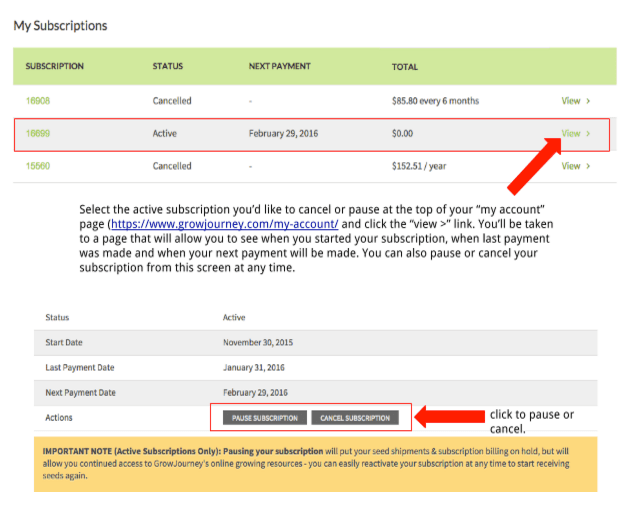 Option 1, Step 1: Click the “Subscriptions” tab (left) and click “View >” next to the active subscription that you would like to update your payment info for. Option 1, Step 2: At the top of the screen, next to “actions”, you’ll see a few options to help you manage your subscription. Click the “Change Payment” button. My credit card was declined and I need to update my payment info to keep my account active. How do I do that? Step 1: Click the “subscriptions tab” (left) and click “view” next to the subscription on hold. Step 2: Scroll down the page until you see the “Related Orders” section. 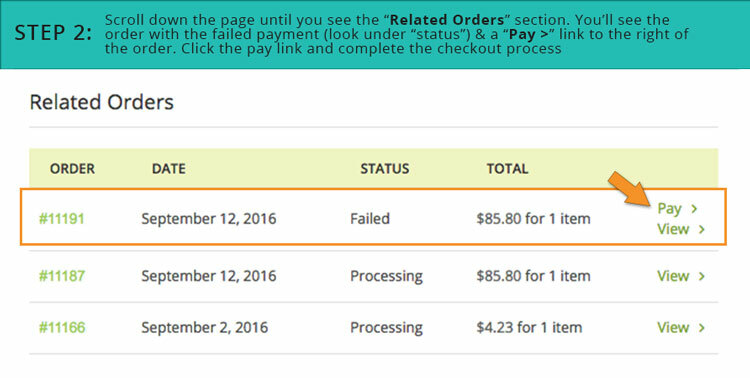 You’ll see the order with the failed payment (look under “status”) & a “Pay >” link to the right of the order. Click the pay link and complete the checkout process. How do I learn how to grow food that is healthy for me and the environment? drastically and naturally improve the fertility of your soil while increasing the biodiversity in your garden ecosystem. In our opinion, the methods (the “how to”) you choose to grow your own organic produce are less important than the broad philosophical approach (the “why”), which will ultimately guide your direction. The philosophy that’s been most helpful to us is permaculture. At its core, permaculture is about observing and working with nature (biomimicry), rather than constantly fighting against it (conventional gardening/agriculture). Why should I use agroecological/organic methods like permaculture to grow food rather than using conventional methods that require synthetic pesticides, herbicides, and fertilizers? We don’t use any synthetic pesticides or herbicides. We don’t use any synthetic fertilizers. Our soil gets healthier each year and we get more and more food each year with less work and less money required from us. It might sound too good to be true, but it’s not. We’re doing it, and so are lots of other people around the world (even large farms right here in the United States). The best news of all: you can do it too. And the more people who take action and care about the world we share, the better off our planet will be. GrowJourney’s online educational resources are designed to help share knowledge from: 1) our team’s personal experiences (our team is full of expert organic gardeners, Master Gardeners, gardening teachers, and permaculture instructors), and 2) from top plant scientists and organic gardeners/farmers around the world. After you’ve grown with us for a couple of years and have a bunch of trial & error under your belt, you’re going to be the “expert gardener” that your friends & family turn to for gardening information and inspiration. Want to try GrowJourney risk-free?